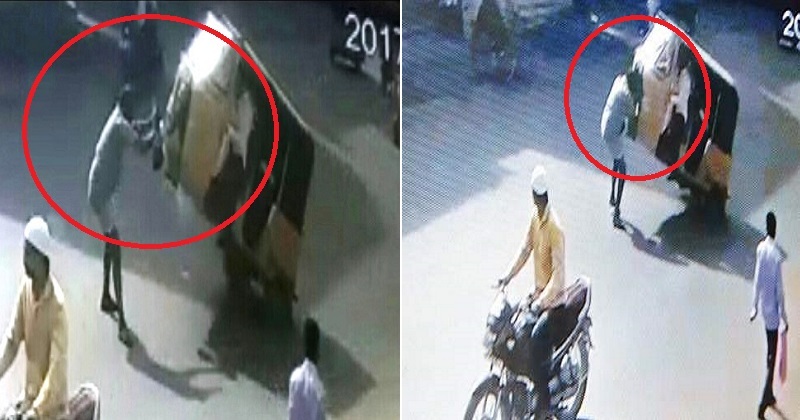 Hyderabad: In a freak accident, a man was killed after an auto-rickshaw flung in the air and hit him in Hyderabad’s Old City area on Sunday. The incident occurred in Shamshergunj when 48-year-old Jangaiah, a daily wage labourer, was crossing the road. He was crossing the road when the road was reasonably free. Suddenly, a passing auto’s front wheel came off the vehicle and hit Jangaiah, who died on spot. The front wheel of the speeding three-wheeler lifted in the air and hit the pedestrian in the chest. The wheel got detached, and the man was crushed under the vehicle and sustained grievous injuries. However, the man succumbed to his injuries even before people could realise what was happening. The accident was caught on a CCTV camera installed in the area. The accident was captured by a surveillance camera installed at a traffic signal near the accident spot. The auto was overloaded carrying five passengers including two men sharing the driver’s seat when the accident took place. The persons traveling in the auto escaped unhurt in the incident. The auto-rickshaw was moving from Falaknuma towards Shamsheergunj when the mishap took place. Shalibanda SI Prathap Reddy said the deceased is survived by wife, two daughters and a son. A case has been booked against the driver for causing death due to negligence. 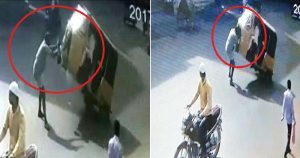 Footage of the CCTV has been recovered and the accused along with the auto has been taken into custody for further investigation, said the SI.